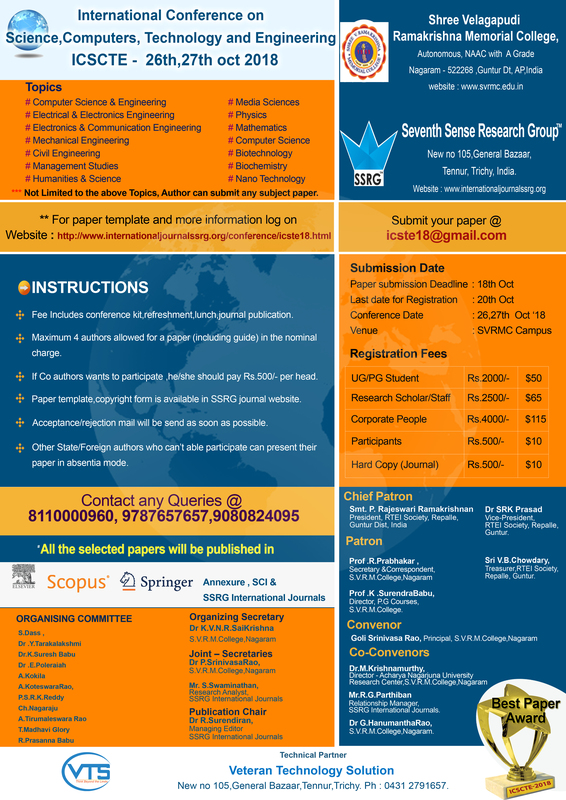 International Conference on Science, Computers, Technology and Engineering (ICSCTE-2018), Shree Velagupadi Ramakrishna Memorial College, Nagaram Guntur District, Andhra Pradesh, India. 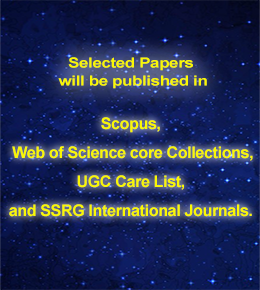 The aim of ICSCTE-2018 is to bring all the research areas together on a single platform. This conference will bring the research scholar communities of different fields together at one place to share their research innovation and ideas. Also the purpose of this conference is to implement the researches of one field into another to bring out the best applications of these researches. Located 16 miles northeast of Guntur City, Amaravathi is named after its famous temple of Amareswara and the Mahachaitya stupa of 2nd century BC. The stupa houses a small museum with a collection of old monuments, and a pictorial depiction of the life and teachings of Buddha. It is located 20 miles southwest of the city, formerly the Kingdom of Prati Palaputra, appears to be the earliest known kingdom in Guntur District. archaeological information gathered in the area of Bhattiprolu. Kondaveedu is located 17 miles from Guntur City. This historical fort was built during the reign of the Reddy kings in 14th century AD there are 21 structures in the fort. The ruins of the fort located on the hilltop offer unraveled mysteries to the tourist. A place of natural scenic beauty with natural wonders it is an ideal place for trekking. The Gopinatha temple and Kathulabave at the foot of the hillock, numerous temples, residential structures, pillared halls on the hill and the entrance gate ways on east and west sides are the attractions at kondavidu. Kotappakonda, the temporal abode of Trikoteswara Swamy, is a village, 25 miles (40 km) south- west Guntur City near Narsaraopet. Its original name is Kondakavuru, but is more popularly known as Kotappakonda or Trikutaparvatam, a three-peaked hill nearby. Though surrounded by other hills, the three hills, also known by the names of Trikutachalam or Trikutadri, can be distinctly seen from a distance from any direction. The three peaks are named after the Hindu Triumvirate, Brahma, Vishnu and Maheswara. Guthikonda popularly known as Dakshina Kasi is located near Narasaraopeta. The Guthikonda Caves is open for tourist exploration as well. Located 13 miles (21 km) northeast of Guntur city, these two places are easily accessible on the Guntur-Kolkata Express Way.Managalagiri is famous for its temple of Lord Lakshmi Narasimha. The hill used to be an active volcano. It is at an altitude of 30 meters above the sea level.